This set is a great introduction to color theory and mixing and the Art Alternatives Economy Studio Acrylics line. It contains five essential mixing colors in 2 oz. bottles, including: cobalt blue, bright red, yellow, black and white. A fold-out color chart and a basic color mixing information sheet are also included. 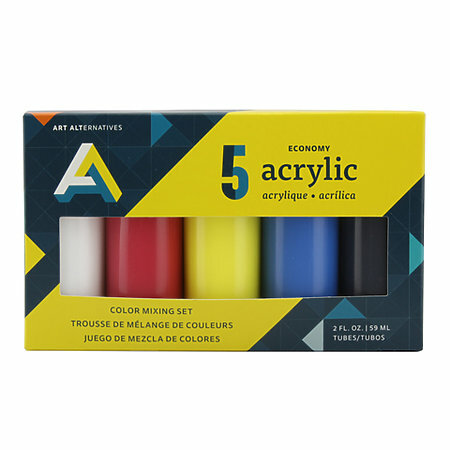 Art Alternatives Economy Studio Acrylics are non-toxic and non-separating medium-bodied acrylic paints with excellent mixing characteristics that dry to a waterproof satin finish. Ideal for large applications, schools, clubs, painting parties and other bulk needs.